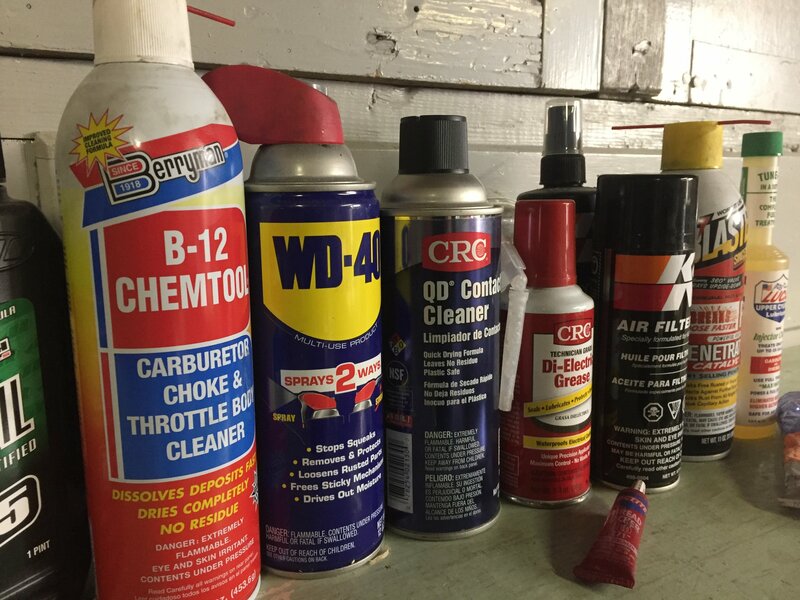 Beyond your basic tools, advanced tools, and after setting up your workspace, you’ll want to get your hands on some chemicals, lubricants, and a few other miscellaneous items to make your motorcycle repair project as successful as possible. The items listed on this page will prove useful in assembly, cleaning, restoration, and general motorcycle maintenance. You can find most items listed on this page at your local auto supply store or hardware store. The following items will be useful as you tear-down, service, and repair your motorcycle. If your motorcycle has been sitting for a long time, penetrating oil will be absolutely necessary to loosen up stuck bolts, screws, and nuts. Whenever you come across a seized bolt, apply a generous amount of penetrating oil and let it set. Acetone is useful for cleaning and removing any oil/grease/moisture from metal parts. Washing soda is useful if you plan to perform electrolytic rust removal on your motorcycle’s gas tank. You may be able to restore rubber and plastic parts that have hardener or become discolored overtime with Armor All or by soaking them in Wintergreen oil. Distilled vinegar, which can be bought by the gallon at most grocery stores, is extremely useful for breaking down and removing rust from old parts. After a soak in vinegar and a scrub, the rust comes right off. As you go through your motorcycle’s wiring harness you should use electrical contact cleaner and a wire brush on the electrical contact to remove any dirt or corrosion that may have built up. The contact cleaner removes all moisture and dries completely. After you clean and remove the rust from your gas tank, you can use a gas tank sealer like RedKote to seal any pinholes and ensure that no new rust will form on your tank. A bucket of Berryman’s Carb dip works well for breaking down gas varnish. Be sure to remove any rubber parts before soaking your carbs. Before you reassemble your carbs, spraying each passage with carb cleaning spray will ensure each is clear. Gasket material can be extremely difficult to remove from engine cases and surfaces. Gasket remove acts as a solvent. The items below will prove useful as you reassemble and preform regular maintenance on your motorcycle. Get a spare quart of oil that you’ll eventually use in your motorcycle’s engine. You can use it as you re-assemble parts so that they don’t go together completely dry. You’ll need non-hardening gasket on certain seals and gaskets on your top end. If you’re doing a motorcycle engine rebuild you’ll need a liquid gasket to seal your engine’s cranckcase halves. Some nuts bolts on your motorcycle shouldn’t move at all. Check your shop manual for where you should apply any thread locker and what strength to use. As you assemble your wheel bearings, steering stem bearings, axels, and swingarm, you’ll need to grease them. Anti-seize lubricant is useful for engine case bolts. Find a good O-ring-compatible chain lubricant to make sure you motorcycle’s chain stays lubricated. A periodic treatment with Seafoam or a comprable fuel treatment can help keep your carbs, fuel delivery, and gas tank in good shape.